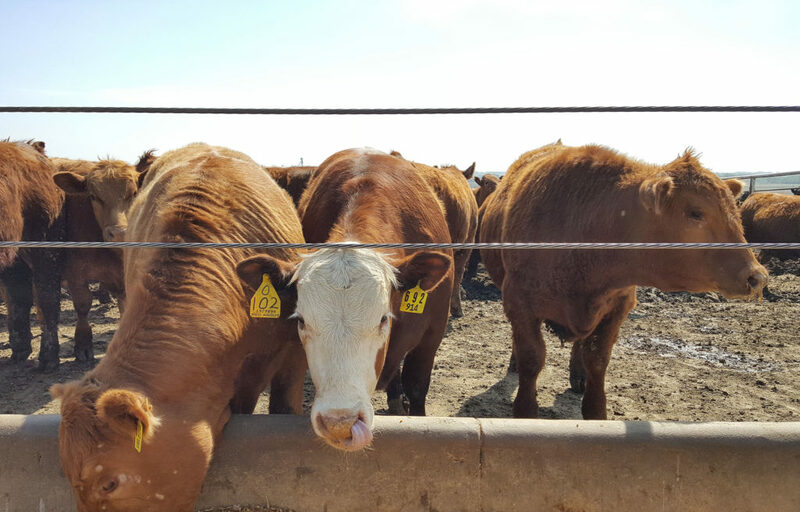 I just got home from Nebraska, where I went on a beef tour that explored the entire life cycle of cattle from calving, to grazing, to the feedyard, to the packing plant. Why Nebraska? I’ll tell you. 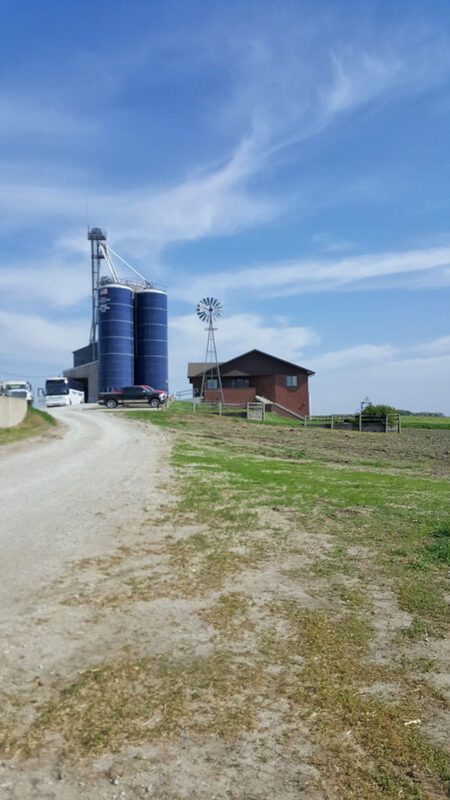 Nebraska’s economy is driven by corn crops, feed yards and cattle ranching. 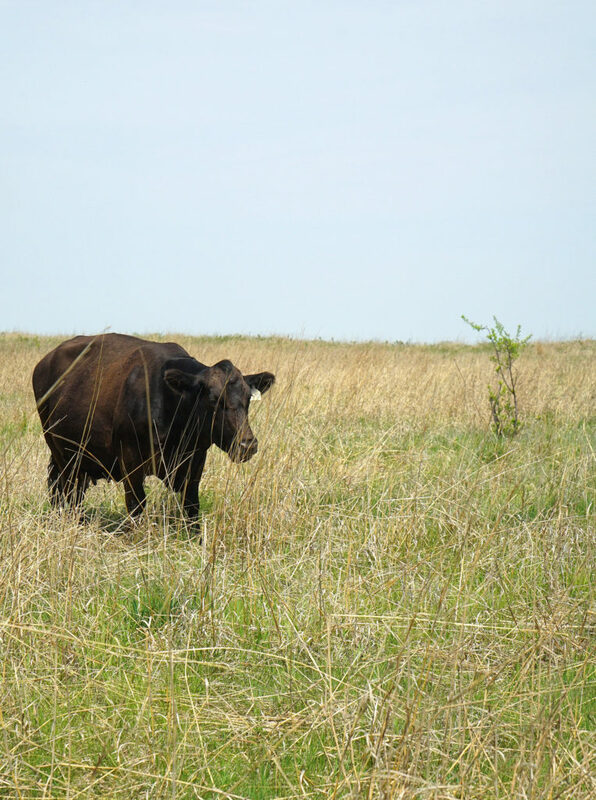 There are nearly two million people in Nebraska but nearly eight million cattle. It’s the number one red meat production state in the country. 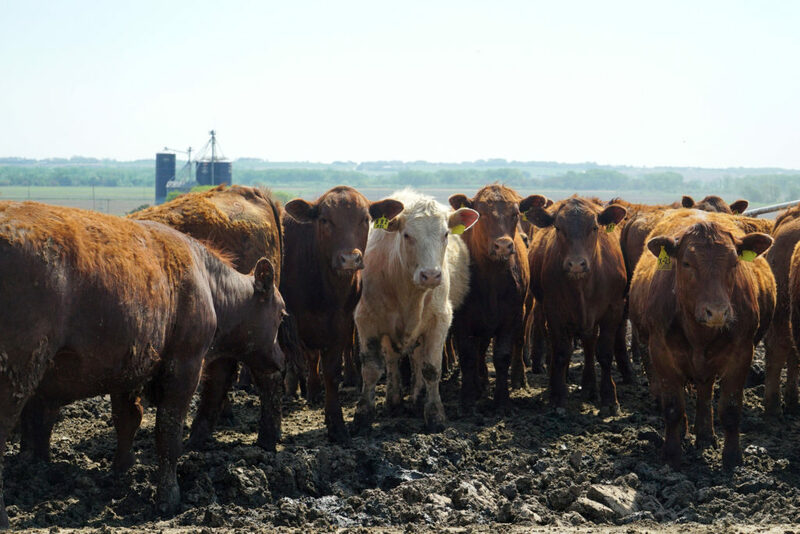 Half of the beef produced in Nebraska goes overseas as export, to the tune of one billion dollars worth per year. The US is the third or fourth biggest exporter of beef in the world, but we also happen to be the number one importer (why we import is a topic for another day). India, believe it or not, is the number one exporter, likely soon to be bested by Brazil. But enough of that. Let me get down to the nitty gritty of this incredible tour. We made four stops: three in the first day, and one on the second day. While this was the first stop on the tour, it’s really the last phase of the animals life cycle before being sent off to the packing plant for harvesting/slaughter. 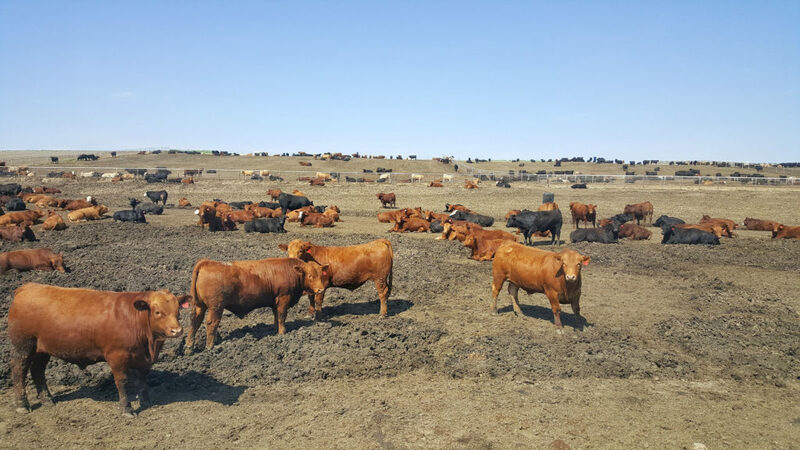 A feedyard is a place where cattle are fattened up to market weight over the course of four to six months. Harry Knobbe (pronounced like Obiwan’s last name) and his family get yearling cattle (roughly a year old), weighing around 750lbs. The animals are generally there for 130-180 days, until they hit 1400-1500lbs, which is a good market weight. Doing the math, that means they generally reach this weight at 15 to 18 months of age, and the animals gain just under 4lbs a day. Each animal eats about 25lbs of food and 100lbs of water each day. Fatties! The feed given to the animals changes as their time there passes. 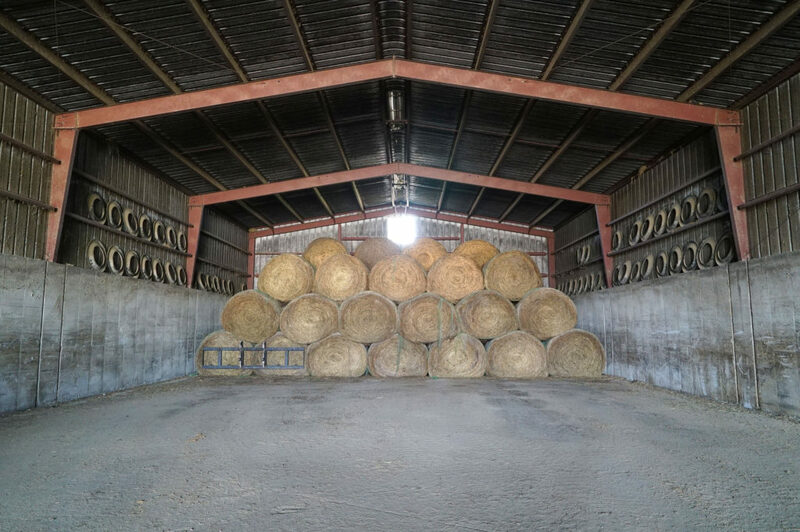 In fact there are six stages of feed with decreasing roughage/grass content and increasing corn content as time goes by (with stage one containing the most roughage content of the six). The animals are coming off of a mostly grazing/grass diet, and need to be acclimated to the corn-rich diet over time. This friendly guy is loving his stage five feed. Just what’s in that diet? 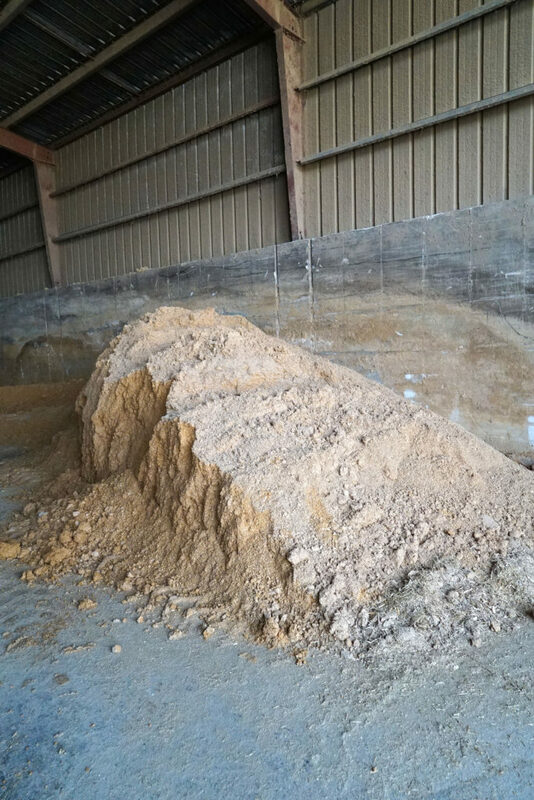 Aside from the roughage and grasses that are always mixed in to some percentage, the feed consists of mainly two byproducts or waste products from the corn industry. 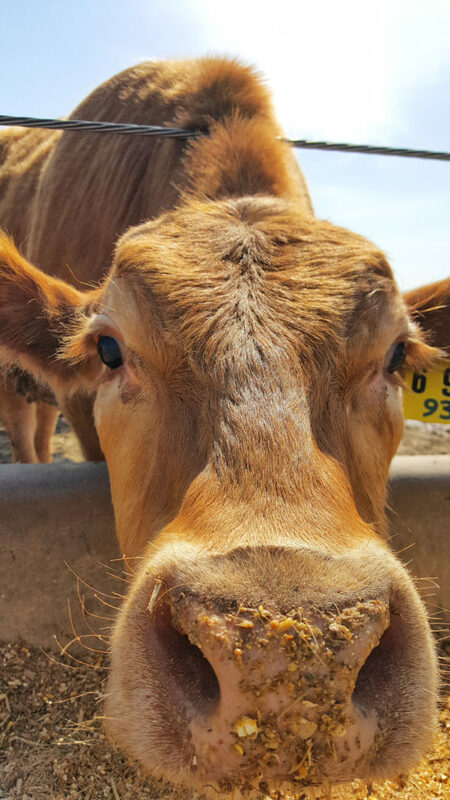 The first byproduct comes from the sweetener and corn syrup industry, and is referred to as “cow candy,” because they love it so much and it smells sweet like candy. 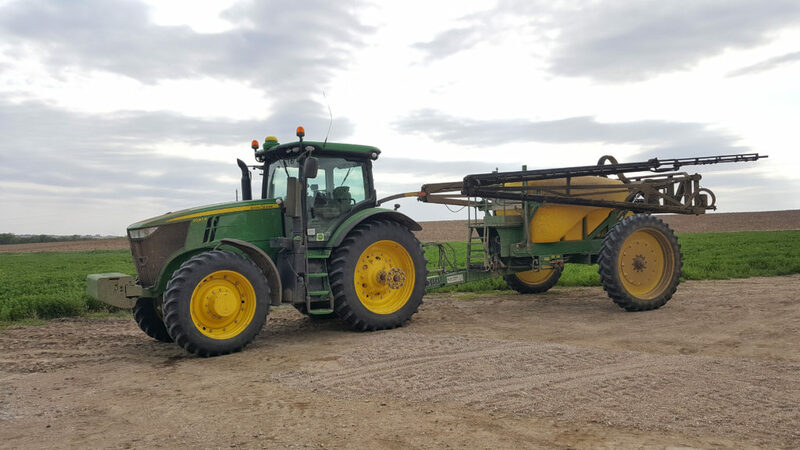 The second corn byproduct in the feed comes from the ethanol fuel industry. 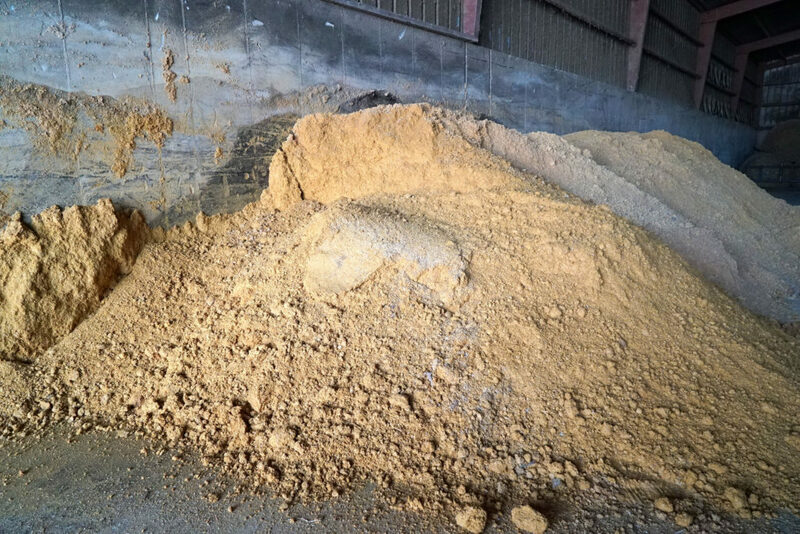 Ethanol plants would otherwise discard this substance, which is similar to the mash left from spirits alcohol distillers. 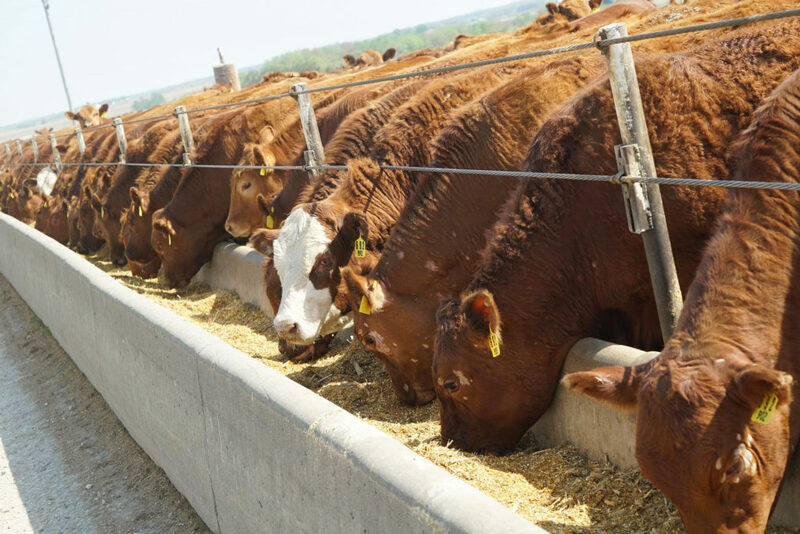 As a general number, the feed gets about 20% of each in the stage one feed, with the rest being roughage. 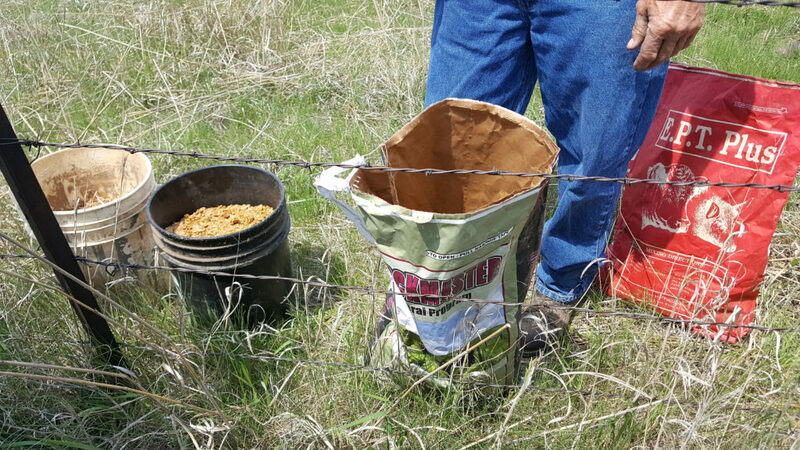 Adding specific quantities of each corn byproduct to the grass. 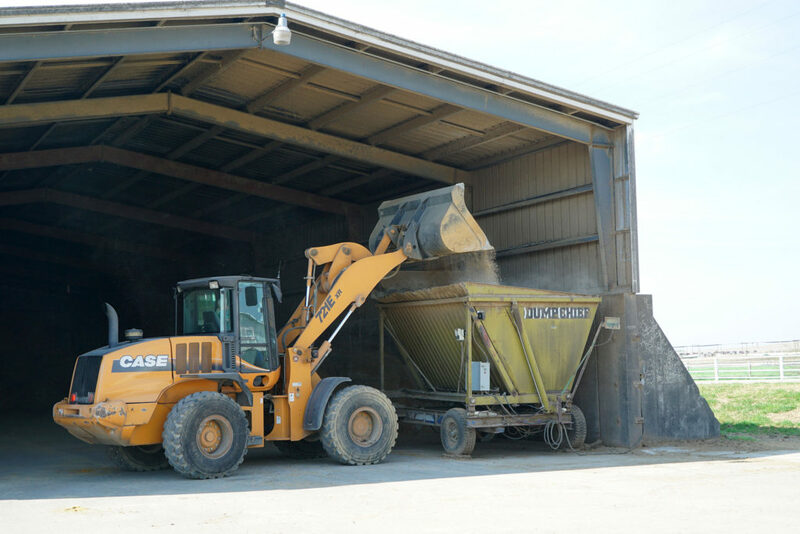 Dumping the feed into a mixing truck that will also fill the troughs. Happy Angus cattle at the trough. This particular feedyard has a capacity of 5000 head. That’s about average in terms of size. 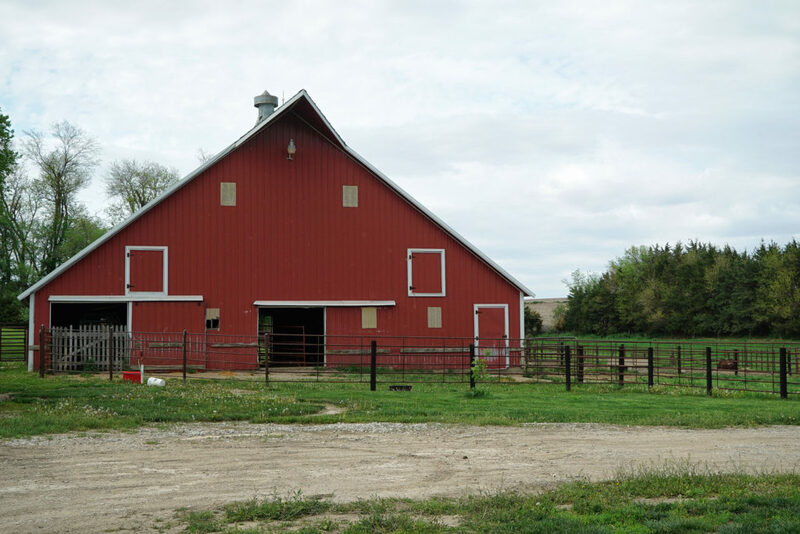 Their large, semi-shaded pens have ample water and space for the cattle, at 250-350sq ft per animal. Oddly enough, the living conditions for cattle don’t change much as feed yards scale up to 10k, 50k or 100k heads; they just sprawl out more. Kbobbe loses seven tenths of one pecent to death, which is a very good statistic. The animals come from all over the place, from different climates and states. Some locations have a higher incidence of parasites, like the wetter climate of Mississippi, for example. As such, the animals are dewormed and vaccinated when they get to Knobbe as a precaution. After all, sick animals tend not to grade as high as healthy animals. Fun fact that I learned here: it’s cheaper to bring cattle to corn as opposed to bringing corn to cattle. Based on the numbers I quoted here, it would require ridiculous amounts of corn truckloads to be moved to cattle ranches for finishing. Thats why animals come from all over the country to finish in Nebraska; all the corn is right there. It also makes sense why Nebraska is such an important place for the beef industry. As for the output of Knobbe, they see about 2-5% of their animals grade at prime, 75-80% choice, and the rest select. This second stop was really the first step in the life of the animal. Don Peregrine runs a third generation calving ranch near Fullerton. 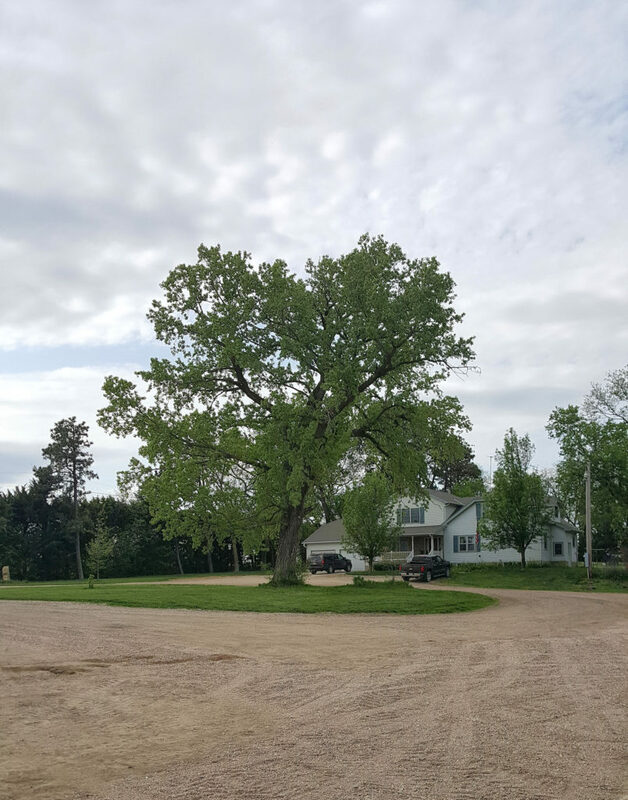 This area of Nebraska is near what is known as the Sand Hills region, which generally separates what’s considered eastern Nebraska from western Nebraska. 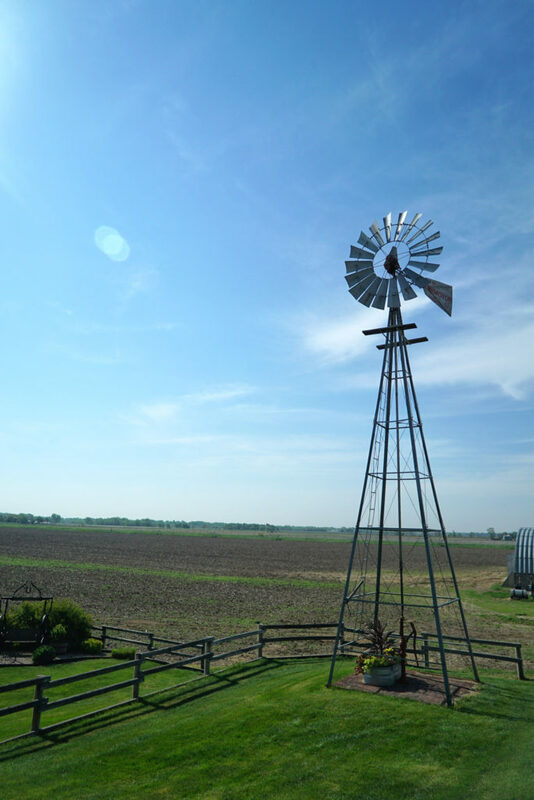 The east is characterized by rich, lush soil that’s perfect for growing corn. 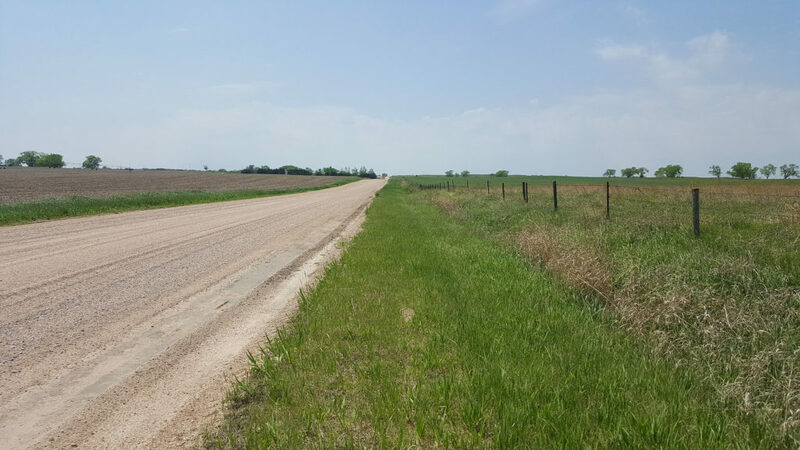 The west, on the other hand, or the Sand Hills, consists of a topography that’s not good for growing corn (think 50 bushels per acre as opposed to 250). The Sand Hills quite literally is a region of hilly topography that’s like sand dunes beneath the grass. 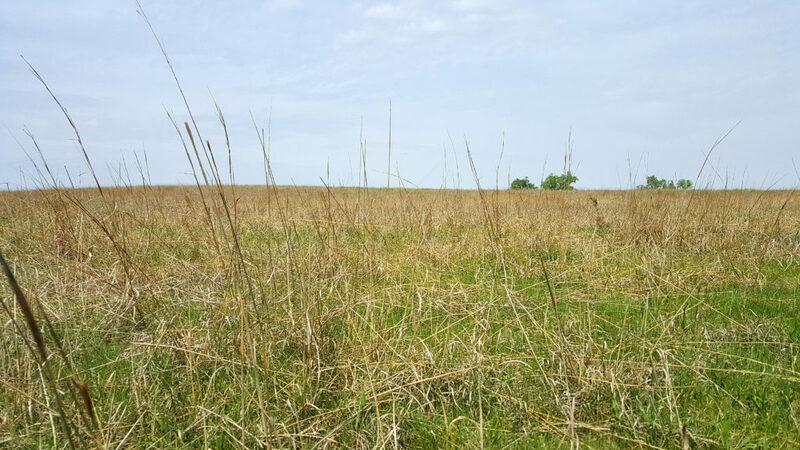 While this is not ideal for growing corn (or much of anything, for that matter), it IS ideal for grazing cattle. 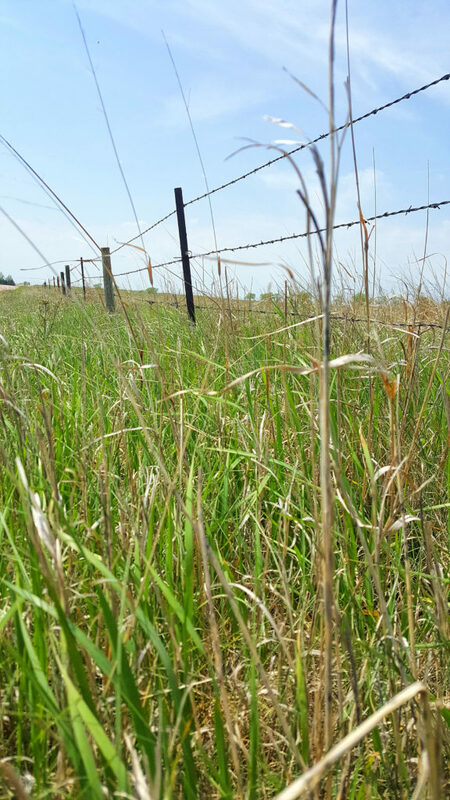 Don Peregrine’s land butts up right against the beginning of the Sand Hills region, so he consider himself a grass farmer as much as a cattle rancher. He’s also got some river bed land, which poses a unique set of challenges in addition to those already faced in the Sand Hills. 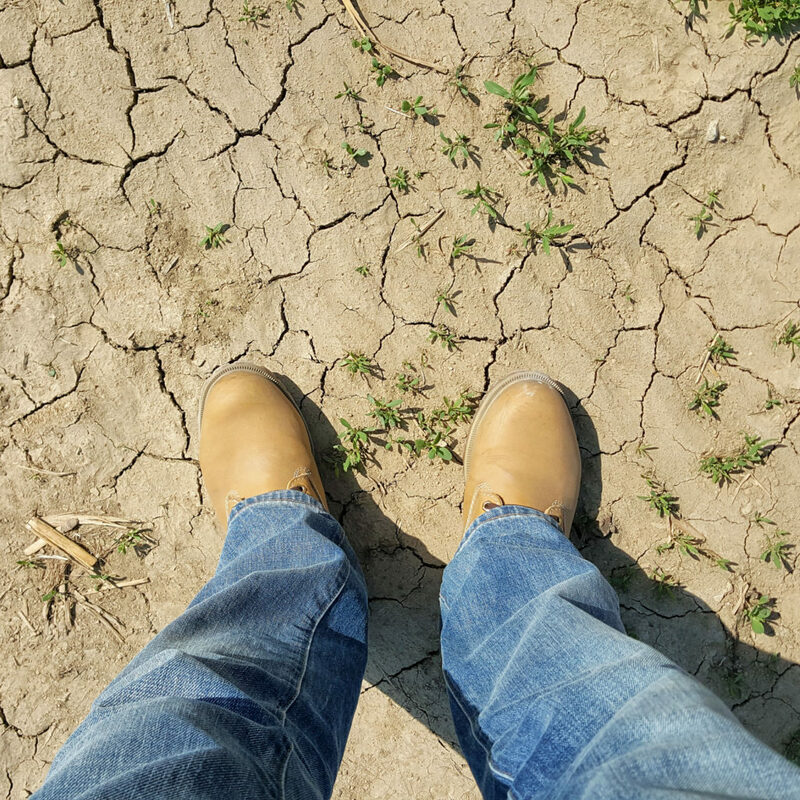 River bed land can cause hoof rot if the animals hoofs are too wet for too long. Aside from his expertise with the land, Don has developed a unique and hands-on hybrid breeding method, with animals that have been selected by him for 40 years. One particular cow we met was 14 years old and had already given birth to 14 calves. He employs herd management techniques like ear tagging (done early), topical dehorning (dries the horn and prevents it from growing without having to grind, saw or burn the horn down), and fence barrier weaning. These all exemplify humane, low stress practices. 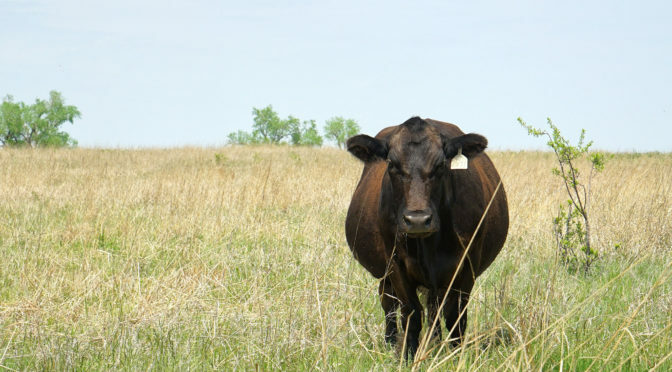 In addition to grass, Don supplements the animals’ diet with minerals, “cow candy” from ethanol and sugar production, and other additives like E.P.T. for development. 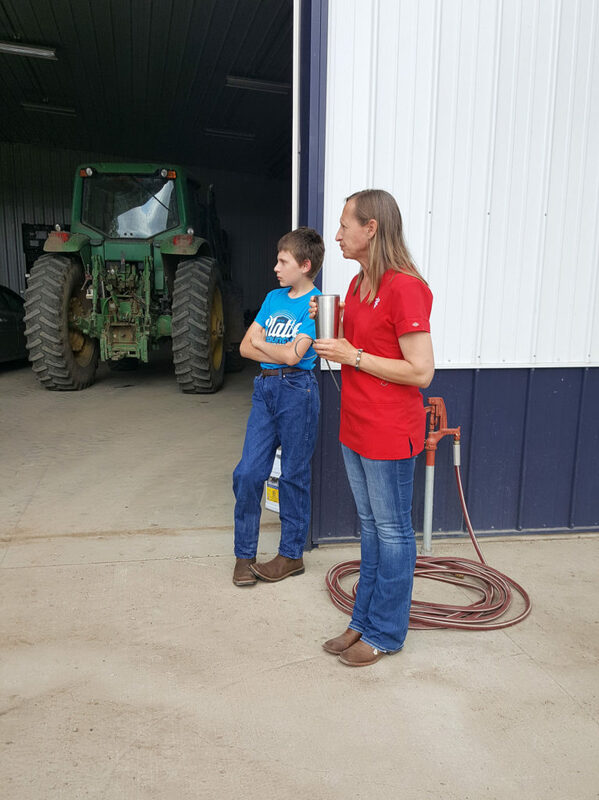 This family not only raises corn, soybeans and alfalfa, but they also run a 3500-head feed yard and a veterinary practice. Amazing! 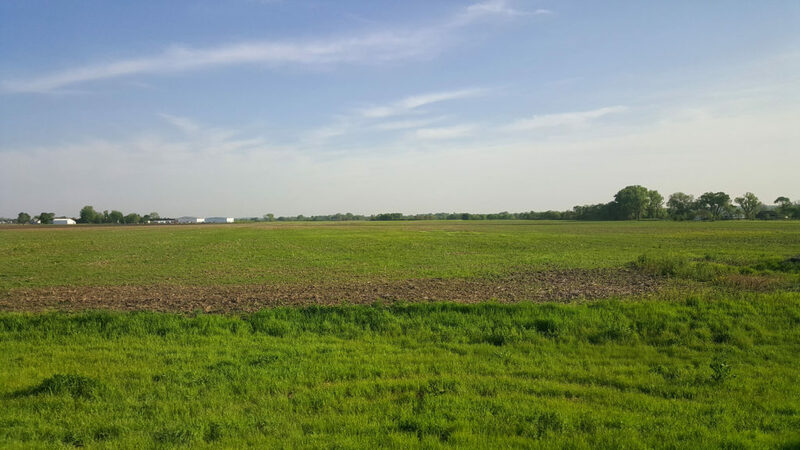 The corn and soy beans make up 1700 acres of their land, with 40 acres of alfalfa nestled near the family home. 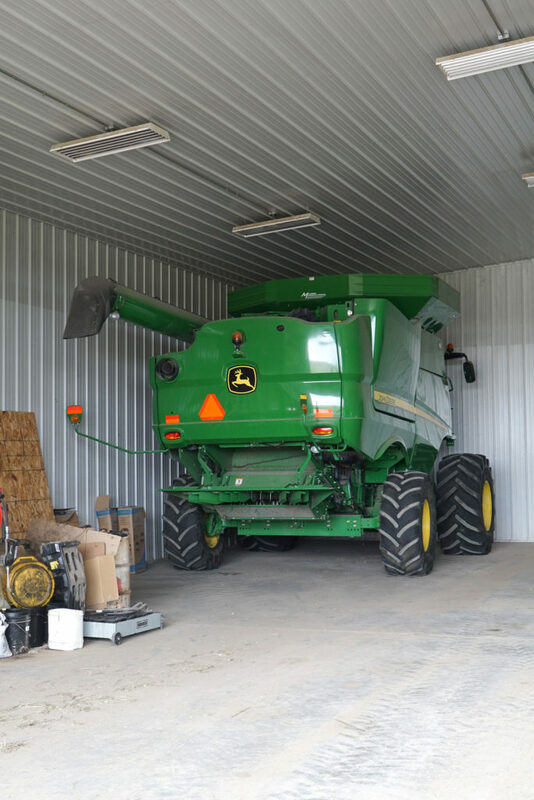 Technology makes it more efficient for them to run and manage their farm. 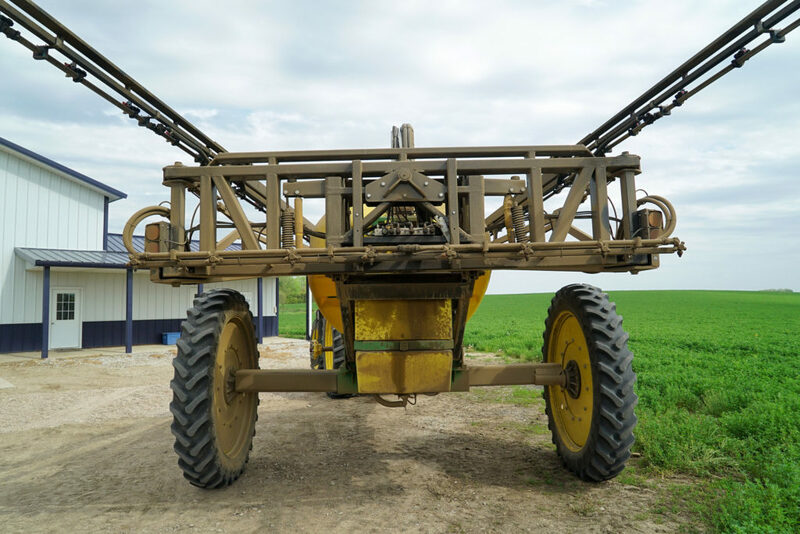 Sprayers and planters are guided by GPS, which allows them to maximize the use of their land and to plant straight rows. It even tells them when less water or spray is needed in certain areas, based on topography and water tables. I was here during corn planting season. In fact Ryan was racing to get corn planted before some forecasted rains. Sure enough it rained a lot later that night and into the morning. Good thing he got that corn planted otherwise he would’ve lost time waiting for the ground to be right for planting again. They’re also vets for large and small animals, including pets as well. This is great, since they’re also running a feed yard and can apply their knowledge of veterinary science to their own animals. 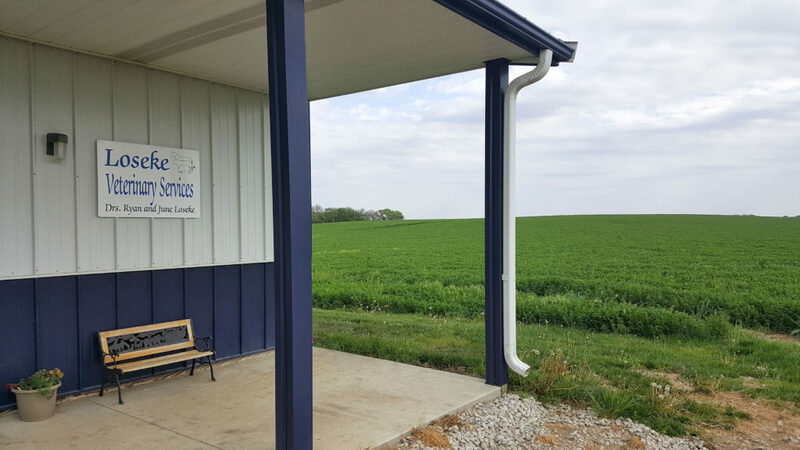 They promote Certified Angus Beef cattle in their feed yard. They sell to Cargill, Greater Omaha and Creekstone packing plants (among others). They even host local kindergarten students from the area schools to teach them about agriculture. June and her son, educating our tour group about their lives. This was probably my favorite part of the tour, since it’s where the animals are harvested into delicious and nutritious beef! Unfortunately cameras are not allowed inside the facility for business proprietary and employee privacy reasons, so that’s the only shot I have. 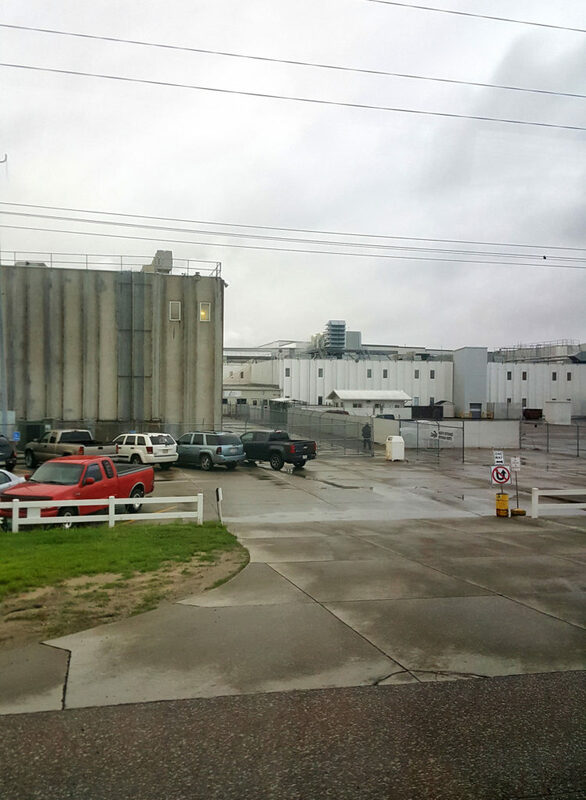 Cargill has been in business for 150 yeas, with this facility being open since 1968. They have facilities in multiple states. They employ about 2200 people at the plant, who hail from 28 different nations but all live in the region. They boast a 40-45% female work force, many of whom are on the fabrication floor engaged in employment that was historically only thought of as men’s work. They’re obsessed with safety and regulatory compliance. They’ve got two labs on site to take samples of air and drainage. There’s also a third party lab engaged for pathogen testing. There are cameras everywhere, with a video room to watch the cattle knocker and the various floors. 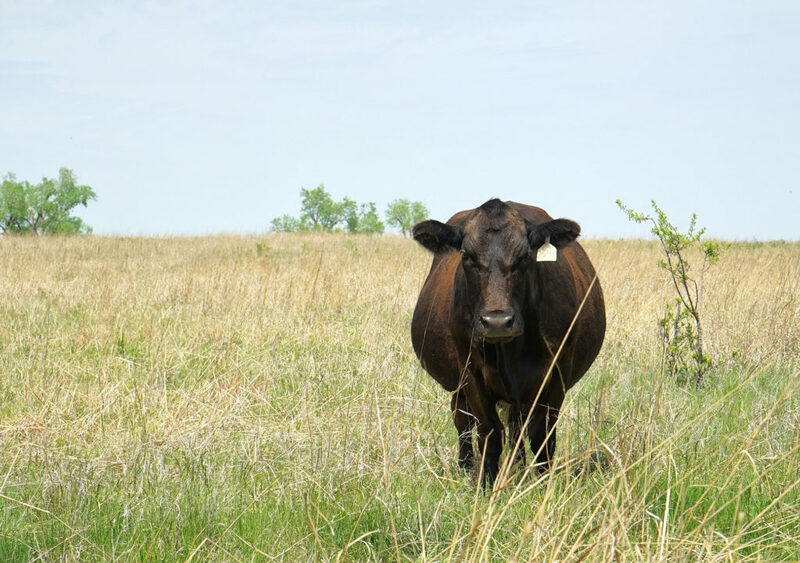 Quality Assurance personnel watches 100% of the time to monitor both the employees and the beef. They can focus in on people to make sure they’re following various requirements, dressing the beef properly, handling knives and sterilizers the right way, etc. If they see something, they can radio a supervisor that can address the situation immediately. There’s also a red button to stop the production line if all else fails. Not only is safety a priority for the Cargill meat supply, given all the USDA and inspectors/auditing folks there all the time, but they’re also always looking out for their employees. They have nursing staff on hand for heat, icing, massage and soreness treatments. They even have hydraulic floor lifts that raise and lower cutters to be at the appropriate and safe work height for butchery. There are two 8-hour processing shifts of work, and one cleaning shift of work each day. The plant processes 5300 head of cattle a day, which is the largest operation in the area. To give you an idea of scale, this comes down to 6.1 million 8oz servings of beef per day, and 3 million pounds of ground beef per week. Impressive. I was told that 64% is a good yield for an animal carcass for edible beef protein. But nothing really goes to waste. Hides, offal, etc. are all utilized in some way, whether it’s rendering or bone gelatin. There truly is no waste. Well, everything is used except for the tail switch (bristle hairs at the end of the tail) and the “moo” (snout). 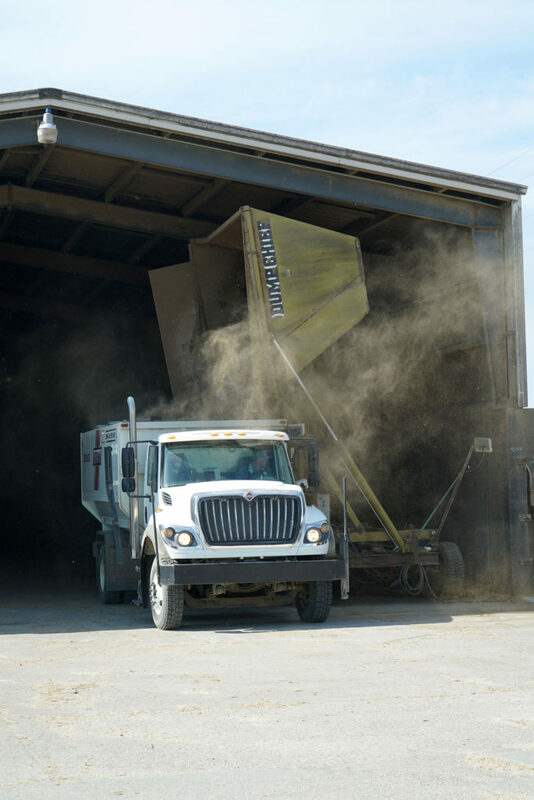 Cargill is still growing, but it’s also modernizing. They’re one of two major packers who use a camera system for grading. A special camera captures an image of the rib eye, then a computer runs an algorithm to generate a scoring number that assigns the a grade to the side of beef. This system makes meat grading less arbitrary and more consistent across their plants. Speaking of grading, Cargill sees about 3-6% prime grade, with most of the rest being choice and select. 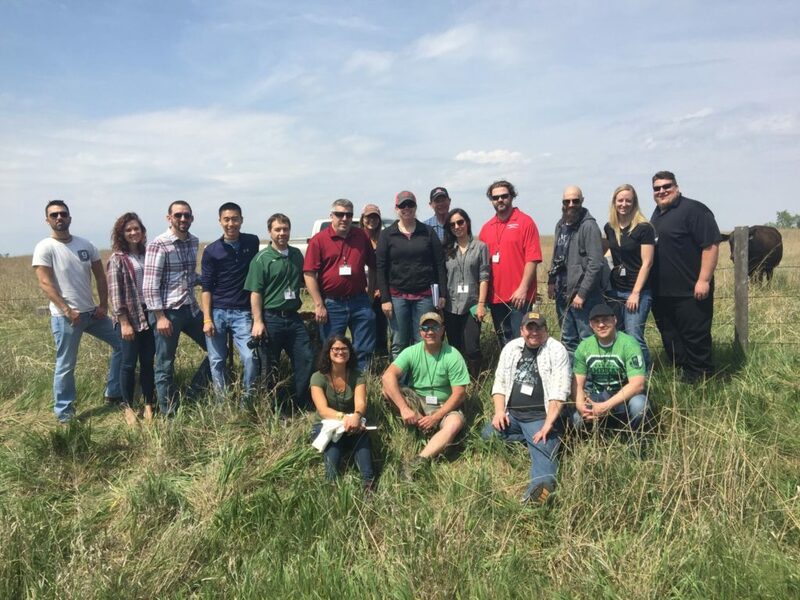 Cargill is also excelling on the environmental and sustainability side of things. 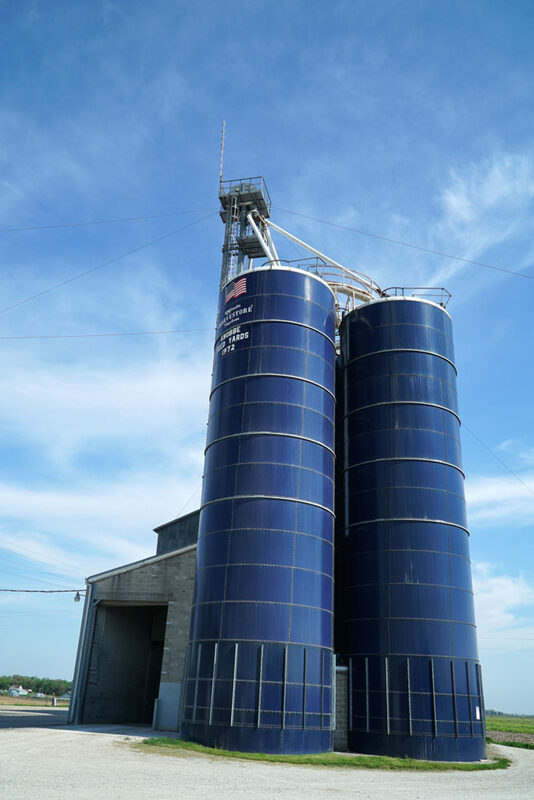 They employ state of the art methane recovery and water conservation and purification techniques. This reduces greenhouse gas emissions by 30%. Being such a massive employment force in the area, they also like to reinvest in the local community. Cargill Cares, United Way and various school programs all exemplify ways in which Cargill gives back to and helps enrich the community. Step 1: This is the unloading of animals from the trailer onto lots. This typically takes place at like 9pm or 10pm the night before the beef is harvested. Once checked, the animals will stay there for 4-6 hours. Step 2: The animals are walked through “the serpentine,” which is a specially designed passageway from the lots into the harvesting floor that minimizes stress. Once the animal is “knocked” it is rendered desensitized. It can no longer feel anything and is unconscious. The first knock happens just after 6am, I believe. Then the animal is cut to bleed out, its hide is removed, it’s eviscerated (offal removed), the head is removed, and then it’s split into two sides. After all that, it is given a ticket with info for the next parts of the process. This step takes 32 minutes. In certain stages of this phase, there are high pressure carcass washes to get mud and hair off, and to trim off any visible stuff that needs to be removed. Steam vacuums are used for bugs and stuff that you can’t see. A 180 degree carcass wash is used to kill E. coli. An organic acid cabinet is used post-evisceration to further these precautions. There is a neck wash, and spinal material is removed with a special bladed vacuum according to directives relating to Mad Cow Disease. There’s also a steam pasteurization cabinet that exposes the carcass to 201 degree steam for nine seconds. This is also done to kill bacteria or parasites. After some of these hot washes, the carcass is immediately chilled again. Remember this is all within 32 minutes! Step 3: The carcass is chilled with water to bring down the temperature. This takes 28-32 hours. Step 4: The bodies move to the sales cooler, where graders look at the rib eye. The special camera that I mentioned above is used here, and a marbling grade is determined. It’s stamped with the grade and then sorted. This takes 12 to 48 hours. Step 5: Once the carcass hits the fabrication floor it takes just 22 minutes to put the final cuts into a box. It’s here that cutters will butcher the various parts into all the commercial cuts, according to whatever is on the order sheets from Cargill customers. Step 6: The Cargill distribution and shipping center is almost 100% automated. The beef can be here for anywhere from 2-36 hours before it goes onto trucks for delivery. Cargill has capacity for 70,000 boxes, all individually shelved without stacking on top of one another. 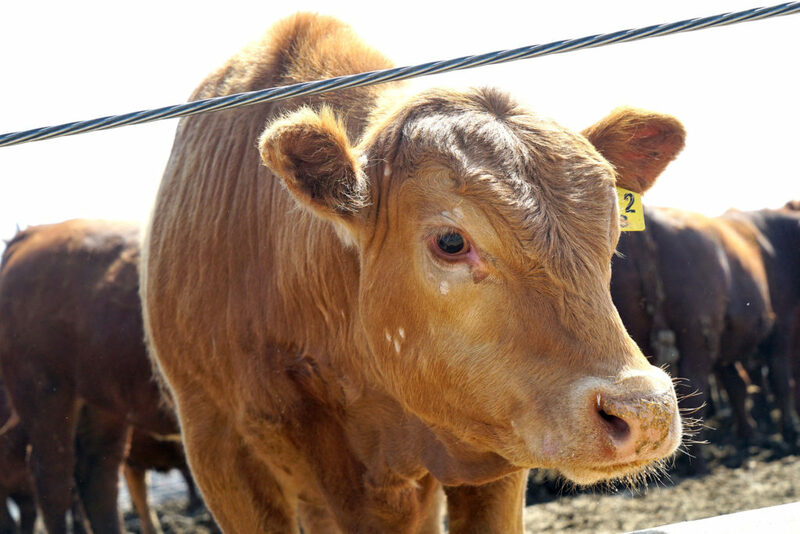 The total time that the animal and end product beef is at Cargill is about 4-6 days. I hope this gave you some insight into how beef is produced; where it comes from, what it eats, how it’s raised, and how it’s broken down for consumption. I really learned and experienced a lot on this tour, and I hope to go on another one soon to learn more about butchery and cuts. Texas A&M’s “Beef 101” course is on my hit list.